By: Devika Kewalramani, Moses & Singer LLP. Federal and state courts have the power to disqualify a lawyer from continuing to represent a client by requiring withdrawal when a disabling conflict of interest exists. While courts are generally reluctant to impose this harsh remedy—recognizing a party’s right to choice of counsel and a lawyer’s right to freely practice law—courts do not hesitate to disqualify a lawyer when client loyalty is betrayed or client confidential information is unprotected. Disqualification of in-house counsel is highly unusual. 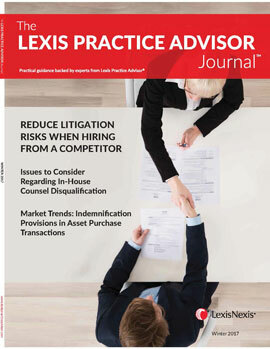 When the disqualified in-house counsel’s conflict is imputed to other in-house lawyers and extended to reach outside counsel, the outcome can be devastating. But it does happen, and lateral in-house lawyers need to be extra careful regarding conflicts baggage they may carry from one corporate legal department to another. Recently, the United States Court of Appeals for the Federal Circuit affirmed a district court’s disqualification of in-house counsel and outside counsel due to a conflict of interest arising from an inhouse lawyer’s work for her new company in a patent infringement suit against her former company in a “substantially related” matter involving communication of her former company’s confidential information to other in-house counsel and outside counsel. The decision discussed below is particularly noteworthy for in-house attorneys because of the district court’s treatment of plaintiff’s corporate legal department as a “law firm” for purposes of applying conflicts of interest rules to disqualify counsel. See, Dynamic 3D Geosolutions LLC v. Schlumberger Ltd. (Schlumberger N.V.), 2016 U.S. App. LEXIS 16645, 837 F.3d 1280 (Fed. Cir. 2016). In the Dynamic 3D case, an in-house lawyer (In-house Counsel) was employed as Schlumberger’s Deputy General Counsel for Intellectual Property for seven years. In this position, she was responsible for developing and implementing her company’s worldwide intellectual property (IP) strategy, protecting and preserving its IP assets (including patents, trademarks, and trade secrets), advising senior executives on IP-related risks, enforcing IP litigation, and directing and supervising outside counsel on IP legal matters. She managed a copyright lawsuit involving her company’s software platform, Petrel, and worked on a “Goldstar” project evaluating the patentable aspects of Petrel while assessing the risk of lawsuits against it. The project also analyzed the ‘3191 patent held by a competitor that was used to turn seismic and well-log data into a real-time interactive three-dimensional display. After seven years, In-house Counsel left Schlumberger to become Senior Vice President and Associate General Counsel at Acacia Research Group LLC, an affiliate of Dynamic 3D Geosolutions LLC, which was assigned the ‘319 patent acquired by Acacia’s parent company (collectively, Acacia). At her new company, Inhouse Counsel met with inventors of the ‘319 patent to discuss its acquisition and possible future litigation, and participated in meetings and telephone calls with other in-house counsel at Acacia and with a law firm, Collins, Edmonds, Pogorzelski, Schlather & Tower PLLC (Outside Counsel) regarding the ‘319 patent and Schlumberger’s Petrel product as a potential target of the patent infringement litigation. Thereafter, In-house Counsel approved a recommendation (prepared by other in-house counsel at Acacia and Outside Counsel) to Acacia’s CEO to acquire the ‘319 patent and sue Schlumberger. In a subsequent patent litigation against Schlumberger, In-house Counsel and Acacia’s other in-house lawyer retained Outside Counsel to handle all patent-related litigation. Then, Schlumberger filed a motion to disqualify counsel from the case on conflicts of interest grounds, which the district court granted, disqualifying In-house Counsel, the other Acacia in-house lawyer, and Outside Counsel. On appeal, the Federal Circuit analyzed Rule 1.09(a) of the Texas Disciplinary Rules of Professional Conduct (Texas Rule) and Rule 1.9 of the corresponding American Bar Association Model Rules of Professional Conduct (ABA Model Rules), which prohibit a lawyer from being materially adverse to a former client in a “substantially related” matter where the lawyer acquired confidential information of the former client, and from using it to the disadvantage of the former client, unless permitted by the rules. On this point, Acacia contended that Fifth Circuit precedent does not require a presumption of disclosure for in-house attorneys which should be based on the duty of loyalty resulting from personal representation, and further that there is no rationale for a presumption since none of Acacia’s “licensing executives” worked for Schlumberger. In response, Schlumberger asserted that under Fifth Circuit law on conflicts imputation to other in-house counsel, the analysis turns on whether the conflicted attorney’s representation was personal. Failure to Screen. The court rejected Acacia’s argument and held that regardless of whether the presumption of disclosure was irrebuttable or rebuttable, Acacia was unable to rebut the presumption after admitting that it had not erected an ethical wall to prevent the flow of confidential communications from In-house Counsel to Acacia’s legal department lawyers. The Court concluded that, “ethical standards are clear that lawyers similarly associated have had conflicts imputed to them.”8 The court reasoned that by attending meetings and deciding to hire Outside Counsel, In-house Counsel “communicated to the other in-house counsel that she supported the litigation strategy and thereby disclosed confidential information to other Acacia attorneys.”9 Significant to the Court’s imputation analysis was the fact that other in-house counsel in Acacia’s legal department reported solely to In-house Counsel until after the potential conflict was raised. This glaring conflict precipitated the Court to impute In-house Counsel’s conflict on Acacia’s legal department to disqualify its other in-house counsel. Watch Out or You’re All Out! Conflicts of interest can disqualify lateral in-house lawyers who move between legal departments the same way conflicts can disqualify outside counsel who move between law firms. The conflicts imputation rules apply equally to legal departments and law firms and can have drastic implications on the disqualified lawyer and all other lawyers who may be contaminated by communicating with the disqualified lawyer, whether in the legal department or at a retained law firm. Legal departments and law firms should conduct due diligence when initially hiring or working with in-house or outside lawyers and constantly be on the lookout for potential conflicts on the horizon before they become disqualifying conflicts. If conflicts actually arise, which they inevitably do, legal departments and law firms should take adequate steps to build proper ethical walls to safeguard client confidences. Otherwise, as case law shows, when the dust from disqualification settles, its practical impact often is the former client’s loss of confidential information and the new client’s deprivation of counsel of its choice. Devika Kewalramani is a partner at Moses & Singer LLP and co-chair of its Legal Ethics & Law Firm Practice. Ms. Kewalramani focuses her practice on legal ethics, professional discipline, risk management, and compliance. She serves as the chair of the Committee on Professional Discipline of the New York City Bar Association. RESEARCH PATH: Corporate Counsel > Ethics for In-House Counsel > Who is the Client > Practice Notes> Who is the Client? 1. U.S. Patent 7,986,319. 2. Dynamic 3D Geosolutions LLC v. Schlumberger Ltd. (Schlumberger N.V.), 2016 U.S. App. LEXIS 16645, 837 F.3d 1280 (Fed. Cir. 2016) at 14. 3. Id. 4. Id. at 12. 5. Id. at 16. 6. Id. at 15. 7. Id. at 16. 8. Id.at 21. 9. Id.at 22 10. Id. at 25. 11. Id. 12. Id. at 27. 13. Id. at 28.